Biohacker’s Live Show features top experts in optimal human performance as if they were in your living room. Your host is Teemu Arina, the co-author of the Biohacker’s Handbook and curator of the Biohacker Summit. Catch each episode by subscribing to our podcast on iTunes here. How to find your chronotype and optimal sleep time? How the Oura ring revolutionizes sleep tracking? How to find balance in your life? How to visualize your chronotype? Why evening persons perform better at cognitive tasks especially in the evening? Why our host needs to sleep more? Hannu Kinnunen is a wearable pioneer, inventor and Chief Science Officer of Oura. Hannu Kinnunen is the brains behind the science that makes Oura the most advanced wearable vital signs monitor in the world. With a long career at heart rate monitor maker Polar, Hannu was responsible for the physiological algorithms, many of which are still used in Polar products today. 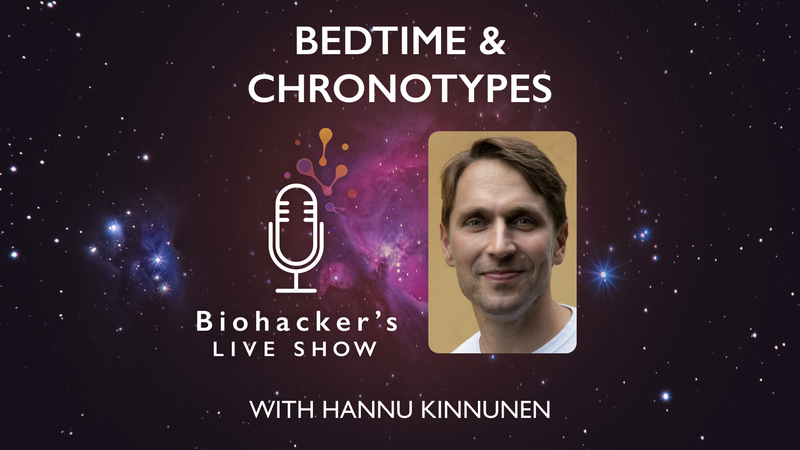 Hannu is credited in dozens of patents and scientific articles on the field of heart rate based signal processing, biosignal detection, and the analysis of activity, training, recovery and sleep. Schmidt, C. & al. (2015). Pushing the Limits: Chronotype and Time of Day Modulate Working Memory-Dependent Cerebral Activity. Frontiers in Neurology. Using functional magnetic resonance imaging (fMRI), we investigated how chronotype and time of day interact with working memory at different levels of cognitive load/complexity. Thirty-two young healthy volunteers, 16 extreme morning, 16 extreme evening types. They were screened for their sleep–wake timing preferences using the morningness–eveningness questionnaire. They were asked to follow the sleep schedule they would spontaneously adopt while free from any social constraints but to keep their bedtime duration at 8 (±1) h for the week preceding the laboratory part of the study. Subjects then entered the sleep laboratory for two nights. The precise schedule of each session was individually adapted to the subject’s habitual bedtime. Subjects underwent a fMRI session 1.5 and 10.5 h after wake up at the scheduled timing. During the fMRI session they were administered three cognitive tasks. The method used in this study was a n-back task which is a continuous performance task that is commonly used as an assessment in cognitive neuroscience to measure a part of working memory and working memory capacity. Accuracy scores (percentage of correct responses minus false alarms) in the N-back task according to the working memory load condition (0-, 2-, 3-back), the time of day (morning, evening), and the chronotype (morning type, evening type). Filled circles: morning types; open circles: evening types. The results were marginal but there was a trend for a main effect of chronotype. The morning types exhibited slower reaction times than evening types, independent of time of day and working memory load condition. The fMRI data analysis showed that evening types exhibited higher activity in the thalamic area of the brain in the evening hours. The thalamus is associated with functions such as the regulation of consciousness, sleep, and alertness. On the contrary the morning types had higher responses than evening types in the morning hours in the other measured areas in the brain. When considering the highest cognitive load performance in evening types, their performance improved from morning to evening hours. The app of the week is Owaves – A holistic calendar designed to optimize your circadian rhythm. Plan meals, exercise, and sleep into your day. Available for iPhone, iPad, and Apple Watch. OURA smart ring is designed to measure your body’s physiological signals. The ring features scientifically proven sleep tracking and personalized guidance that is based on data from over a million nights and days. With Oura you are able to understand how your lifestyle affects your body and mind as well as learn your optimal times to move, eat and take a break to get enough restorative sleep. The ring is to be worn around the clock and it measures your sleep stages, resting heart rate, heart rate variability, and body temperature – all important recovery indicators. In addition to sleep and recovery, the smart ring gives you a holistic view on your activity and its effect on your well-being. 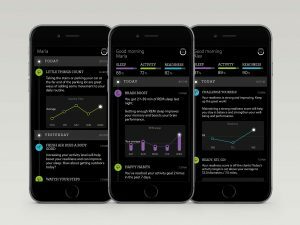 As rest and activity influence each other, Oura provides you with an all-encompassing image of your mental and physical health and performance. You can now get 50 USD / 50 EUR discount on the OURA ring at their site by using the code BLS during the checkout.